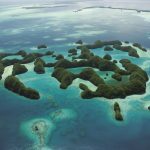 Palau (also known as Belau) is a playground of over 200 islands, scattered across a distance of 70 miles in the Western Pacific Ocean, providing some of the best dive locations in the world. THE exact position is 07°30’N 134°30’E which is approximately 360 nautical miles east of the southern part of the Philippines. The islands vary geographically from the high and mountainous largest island, Babelthuap, to low coral islands usually fringed by large barrier reefs. The Rock Islands are quite unique and instantly recognisable in photos. It is worth noting that only eight of these islands are permanently inhabited. The main urban area is Koror and the total population is approximately 20,000 people. The wet season is from May to November, when it is considered to be hot and humid and there is a risk of typhoons from June to December. The local currency is US dollars and most people speak English. When arriving in Palau, there are two directions from which to reach the commercial port. One is through the northwestern channel (07°32’39”N 134°27’23”E) and the other is through the southeastern channel (07°16’30”N 134°28’11”E). A pilot is compulsory for vessels over 200 GRT, when entering and departing Palau. 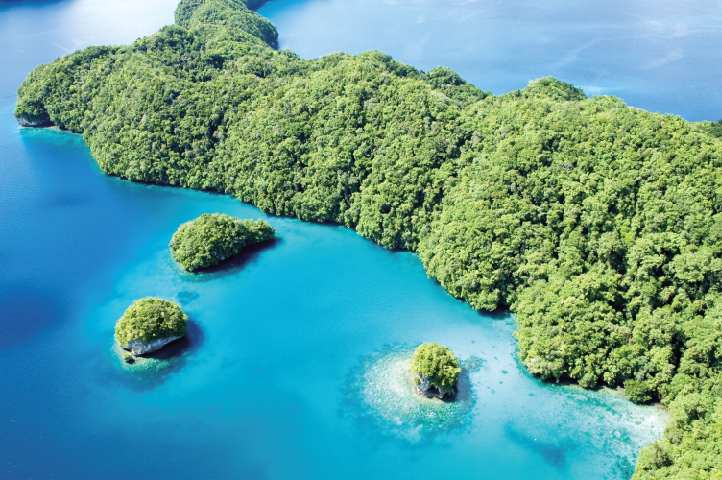 While cruising Palau waters, a pilot is not necessary but a guide with good local knowledge is highly recommended. Google Earth is a great way of familiarising yourself with the area. In order to clear in and out of Palau, one must go alongside at the commercial wharf (07°19’49”N 134°27’27”E). Once alongside, the pilot disembarks and the agent comes aboard with Immigration, Customs, the Department of Agriculture and a host of other mysterious government agencies. It is a fairly straightforward process of handing out copies of ship’s registration papers and crew lists. Please be aware that they may ask to seal your freezer for the duration of your stay and will expect you to throw out all fresh produce. The sealing of one’s freezer is “negotiable”. Any rubbish on board that has the remains of fresh produce will have to be disposed of by the government. This will be taken away separately with the remaining fresh produce and destroyed. Should you require fuel, this can be arranged in advance through Sam’s Dive Tours. Palau Shipping Company (www.palaushipping.com) is the recommended agent to use with regards to making sure clearing in and out goes smoothly. It is best to contact them several weeks in advance to make sure that all the required paperwork is in place. Once the vessel has cleared in, one can either stay at the commercial wharf, but bear in mind that it is a working commercial wharf, or one can anchor as close to Sam’s Dive Tours (07°20’18”N 134°27’13”E) as possible. Any vessel up to approximately 50 metres can comfortably anchor in the natural shelter of the basin, which appears to be an old crater, outside Sam’s Dive Tours. There is a narrow channel leading in to the basin of which the depth must be checked before attempting the entrance. One can expect the minimum depth to be three to four metres depending on the state of the tide. Once inside, the depth drops away to in excess of 20 metres. If one is not comfortable anchoring inside the basin, one can anchor before the small channel, still in sight of Sam’s Dive Tours. The advantage of anchoring here is that there is a very good pontoon here which can be used for arriving and departing guests, not to mention being the location of a very pleasant bar for the crew to enjoy a sundowner! During your stay in Palau, it is highly recommended using Sam’s Dive Tours (www.samstours.com). They can provide a guide with good local knowledge to safely move around these reef-littered waters. 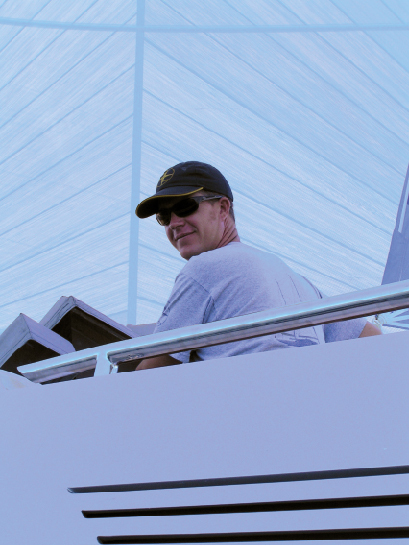 They have helped every large yacht that has visited Palau over the last 10 years. Hence they know what the requirements are and can help very effectively including such things as provisioning. The selection of goods for provisioning is fair in Palau. It does however depend on how recently the supply flight from Guam has come in. It pays to hunt around for goods as different supermarkets may have entirely different supplies. An imaginative chef is also an advantage as it certainly is not the same selection as one would expect from a “western” supermarket. The alcohol selection is very poor with regards to quality. Sam’s Dive Tours can help with itinerary planning, obtaining various permits for persons, tenders, fishing and the vessel. 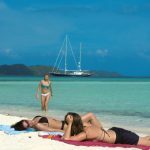 They can also help organise all types of activities for both guests and crew, such as helicopter rides, kayaking trips, overnight camping on deserted beaches, diving, snorkelling, fishing, shore excursions and exploring the islands. The airport is approximately half an hour’s drive from Sam’s Dive Tours and once again they can help out with providing transport. They are the ultimate one stop shop for all your requirements. Bear in mind that all commercial flights come through either Guam or Manila. 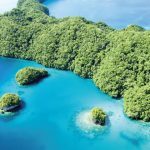 A Cruising Permit must be secured from Koror State Rangers before departing Malakal Harbor for the beautiful anchorages of Palau’s Rock Islands. 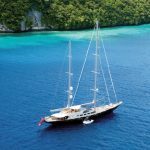 Keep in mind that large vessels may be constrained by draft however, regardless of your particular anchorage Palau is beautiful and one can easily move around using the tender to go to beaches, dive sites, exploring the Rock Islands, etc. 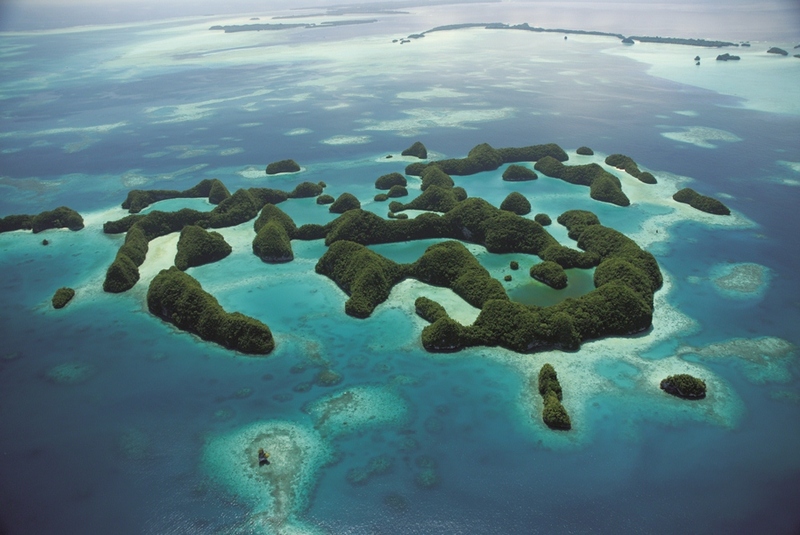 It must be noted that the diving in Palau is commonly considered amongst the best in the world. It is worth trying to time one’s dives when the dive companies don’t have their customers diving. It can get very busy on some dive sites. 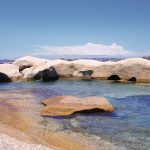 With regards to the beaches, they can get relatively busy at lunch time when the dive companies take their customers there. By mid afternoon the beaches are usually deserted again and one can enjoy complete privacy. 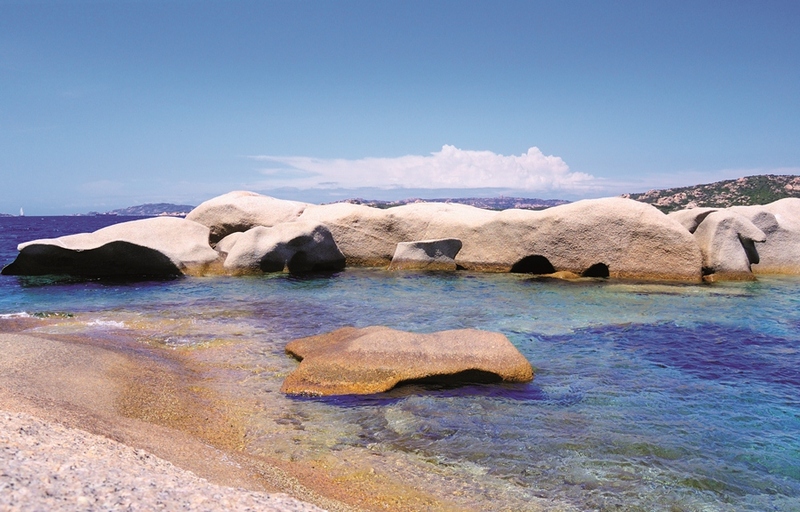 There are some private beaches, for which a permit can be obtained. This is worth considering. All the beaches are kept immaculate. 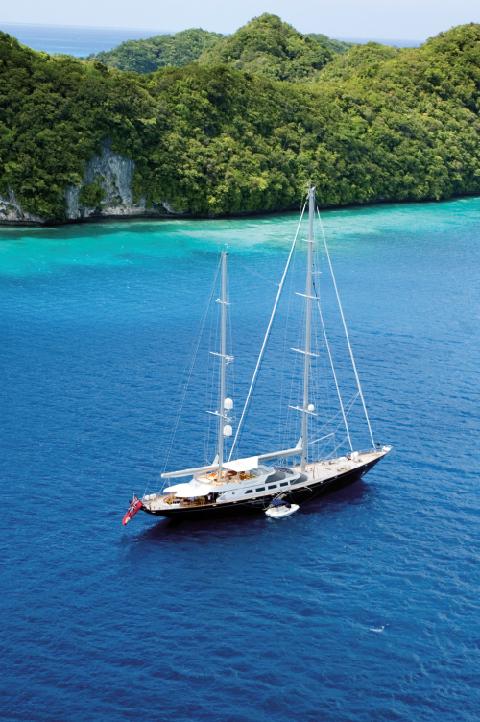 In conclusion, the Republic of Palau is an absolute must for any superyacht owner who enjoys diving but also for those that simply enjoy beautiful islands, reefs and beaches set in an incredible array of different shades of blue water. It is a unique and pristine place that encompasses the ultimate getaway, which is for many superyacht owners, the prime objective of cruising far flung Pacific Islands. Here lies endless paradise, welcoming you with open arms.